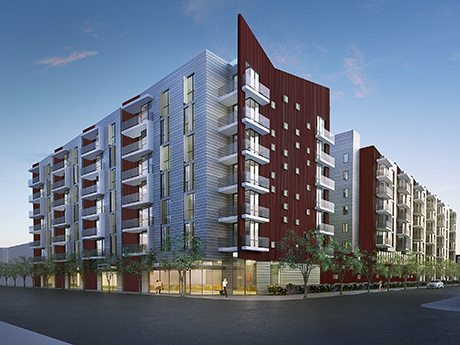 Construction on Deluxe Hollywood, a development transforming an existing 70,000 square foot office building into a six-story apartment building with street-level retail space, is expected to commence by the end of this year. Gemdale Properties and Investment, a subsidiary of China’s largest blue chip real estate developer, and Los Angeles developer La Terra Development are spearheading the $125 million mixed-use project. The project is expected to include 254 residential units located one block from Sunset Boulevard at 1350 N. Western Avenue. It is in walking distance to transportation and Hollywood’s vibrant nightlife and retail district. According to a recent LA Times article, the venture comes follows a recent investment by Chinese developers funneling billions of dollars for retail, hospitality and new construction condo projects around Staples Center in downtown Los Angeles. For this particular project, developers are looking to target a younger demographic with their smaller sized units and a $2,000 monthly rental price. The project is estimated to be completed in 2018. It will have a campus-style environment featuring sustainable building elements.